This page is a WIP. There are likely to be incomplete and or missing steps while the page is being built. Whether you are working online, or offline, Install Manager allows you to manage the products it knows about and check whether they are installed or not. This allows you to quickly see your your content without worrying about spreadsheets, going online and searching your account or digging through your install folders. the installations are fast and can be done en mass or individually. 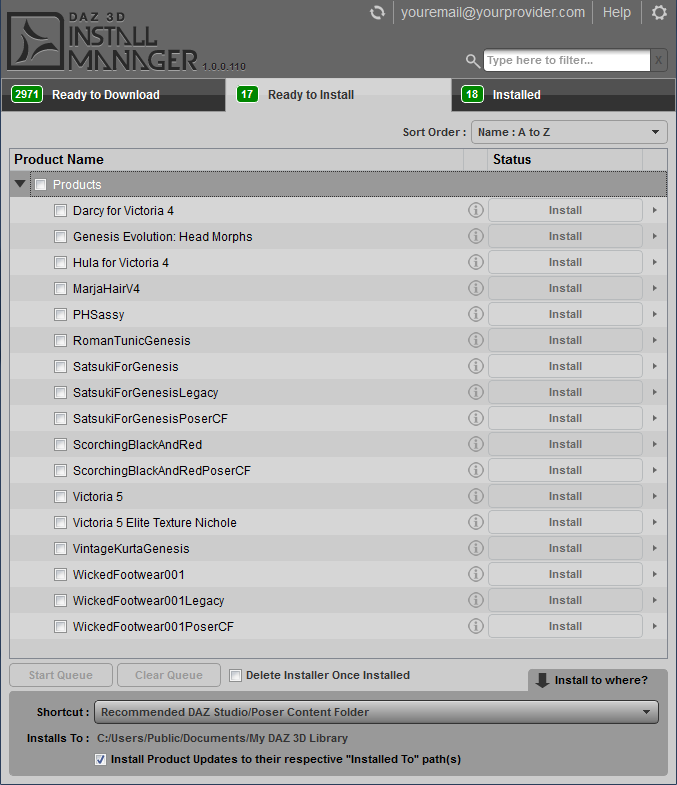 In order to install the content downloaded with Install Manager, you should have your install locations set up. If you need help with this, please check the User Guide. Remember, Install Manager will not 'see' files saved in locations not mapped within the application, nor will it see files downloaded via other applications or manually. In other words, if you download a product zip from another store, Install Manager will not be able to see and manage that file. Open Install Manager and open the “Ready to Install” Pane. You should see a list of any products you have previously downloaded using Install Manager, that have not yet been installed. Since Install Manager can only track products it has managed (downloaded), you will not be able to see any files that may have been saved to the same location. For example, saving zip files from a store other than DAZ3D. Shortcut: Choose your install location from previously added directories. Please see: Configuring Install Manager if you need help setting these locations. Installs To: Gives you the path to the current chosen location. Install Product Updates to their respective “Installed To” path(s) - When checked, will install updates to their currently installed location. Checking the “Delete Installer Once Installed” will do exactly that. When you install a file, its Zip file will immediately be deleted from your computer. Be sure to Uncheck this box if you want to keep a copy of your Zips! Install All Files - Check the “Products” box and all your files will be selected under the header. Click “Install All Selected”. Install Selected Files - This is the same, but instead, individually select the files you want to install. This is good if you run multiple programs and want to install to separate locations for each program. Again, click the “Install All Selected” when you have made your choices. Install One File at a Time - To install a single file in the list, you can click the “Install” button to the right of the file you want to install. Install to Where - Install Manager allows you to set up multiple installation paths and then bookmark them for convenience. This is advantageous if you use multiple programs such as DAZ Studio, Poser, Carrara, and have separate content locations for each. You can change your install location on the fly. If you have multiple locations, make sure the correct one is showing in the path under “Install to Where” before installing the files you have selected. You can add a location on the fly by selecting “Add Location…” from the “Install to where?” dropdown on the bottom of the screen. This will open the same “Settings” window where you initially added your locations. View the Product ReadMe - You can view a product's ReadMe at any time by clicking the “?” to the far right of the Product Name. 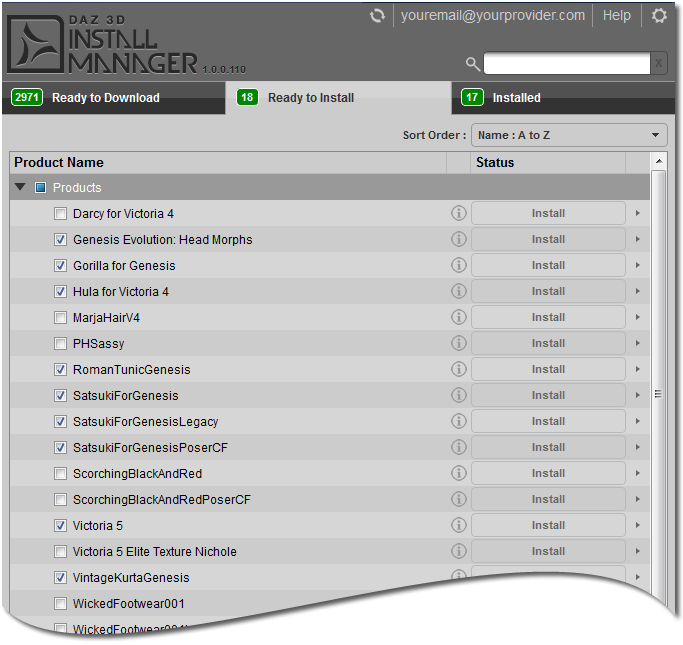 Once you have installed your products you will see them in the “Installed” pane. You can also check this pane to see if the product installed Metadata. If so, there will be a checkmark underneath the “Smart” column, letting you know it will show under “Smart Content” in DAZ Studio 4 and higher. Name: A to Z - Sorts the list by descending alphabetical order. Name: Z to A - Sorts the list by ascending alphabetical order. Product ID: Highest First - Highest ID, in descending order. Product ID: Highest First - Lowest ID, in ascending order. Installer Size: Largest First - Largest Zip size, in descending order. Installer Size: Smallest First - Smallest Zip size, in ascending order. Installer Date: Recent First - Newest downloaded, in descending order. Installer Date: Oldest First - Oldest downloaded, in ascending order. Order Date: Recent First - Newest purchases, in descending order. Order Date: Oldest First - Oldest purchases, in ascending order. Status: Busy First - Active Zips in Queue, in descending order. Status: Idle First - Idle Zips in Queue, in ascending order. Selection: Selected First - Selected Zips in Queue in descending order. Selection: Non-Selected First - Non-Selected Zips in Queue in ascending order. Filtering in Install Manager is very easy, but also has very advanced filtering modifiers available. We will cover the basic keyword filtering below. Please refer to the Reference Guide section on Advanced Filtering for more ways to view the products you want to see, and how you want to see them. If you want to filter your file view to show only specific files, you can type your chosen keyword in the “Filter Field” as shown in the left-hand image below. We used 'Genesis'. Only products with the keyword 'Genesis' in the name, are showing. You can also use phrases. If you know all or part of a product name, type it in and the filter will show any products with that particular 'phrase'. The nice thing about this feature is that is keeps your checked selections as you change filter words. Here, we are going to check the selection boxes for 'Genesis'. In the right-hand image below, we left our “Genesis” filtered products checked, and then filtered by 'Victoria' and checked these products as well. When we return to our full list of products, you can see both filtered selections we made remain checked. The “Genesis” products remained checked, even when we ran a new filter and added the other product for “Victoria”. The filtering feature works across all the status windows. 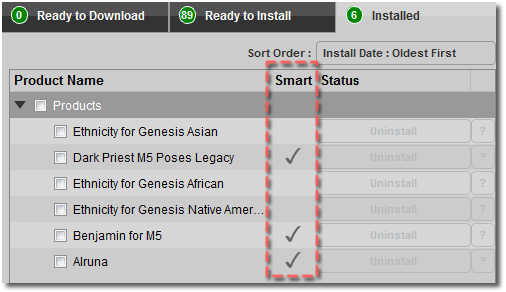 By this, we mean if we have 1 product with “Genesis” in its name already “Installed”, and 6 waiting in “Ready to Install”, we will see all 7 products. You can see this in our “Genesis” example here. We installed the Gorilla product from our previous filtering exercise. You can now see we only have 6 left in Ready To Install, and 1 is now listed in Installed. You can do the same thing using the SKU number to find a particular product. Just put the number (or a range of numbers 12350-14350) in the Filter Field. This is all that is required for content installation. Uninstalling files is very similar. When you are ready, please read Uninstalling With Install Manager (WIP) for more help and information.